I decided to set this whole story before, during & just after dawn. The light that comes from Jesus, Moses & Elijah in the transfiguration is mirrored by the light that occurs as the sun is rising over the earth. It’s as if God’s natural light (the sun) is part of the transfiguration & almost pays a natural homage to Jesus, the sun’s creator, before the light of the transfiguration takes over. Then, after the cloud has disappeared, we see the 3 disciples worhipping Jesus, once again the scene is bathed in the natural, worshipful glow of the sun’s own light. Sunrise: natural sunlight, diffused by the cloud. Campfire being blown out! Although the same story, read in Matthew 17:1-13, refers to “a bright cloud” I decided that a dark cloud would provide more drama & contrast with the rising sunlight. Jesus, Simon/Peter, James (son of Zebedee), John (son of Zebedee), Snow vole. The voice of God the Father is here represented in written text… one of the limitations of a cartoon is that there is no audio! 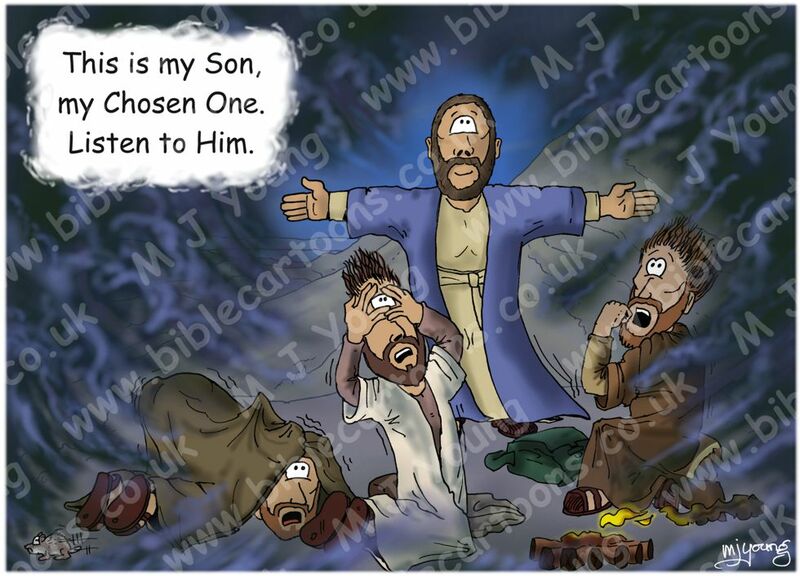 The scripture clearly states that the disciples “were afraid as they entered thye cloud” – hence their expressions in the cartoon. Jesus has his arms outstretched in a gesture that foreshadows his evenual crucifixion, which is what Moses & Elijah were discussing with him in the previous scene. we know this becuase the Bible states: “They [Moses & Elijah] spoke about his [Jesus] departure, which he was about to bring to fulfilment at Jerusalem. I did not illustrate Jesus with a worried expression at the prospect of his own death, since He already knew what was going to happen to Him, & in this scene He is closely communing with God the Father in the cloud. Google earth position & orientation – 33 deg 26’ 46.81” N 35 deg 54’ 51.73” E looking NW, towards the sumit of mt. Hermon. Israel is beyond that mountain. The viewer can see the Sea of Galillee approx. 42 miles away, & the Galilee region of Israel. I deliberately set Jesus & the 3 disciples here, so that mt. Hermon was in the cartoon, with a view that includes the Sea of Galilee to help the viewer orient themselves. My research led me to include a Snow Vole (Chionomys nivalis) in these cartoons. These small rodents are to be found on mt. Hermon. Wikipedia: This vole is active by night as well as by day when it is quite easy to spot, especially on sunny days. It gets food from the roots of various alpine plants. It digs tunnels with numerous exits and a nest chamber as well as a kind of a storeroom. It does not hibernate in wintertime and often takes shelter in cellars, barns or haylofts to protect itself from the low temperatures. It holds its tail in an upright position when running.